Pair of wood hanging lamps made for our bedroom. Parts resourced from multiple stores/websites. Made from Tigerwood with Ebony plugs. Simple, cool and functional. Nice choice & work. Nice design. It looks pretty cool. Nice work – I like that cord you used. I had my buddies sister ask for something she saw for a similar design a year or so ago. Made her these and I kind of forgot about them until I saw yours. Nice job! Those look great! What wood did you use? Thanks! 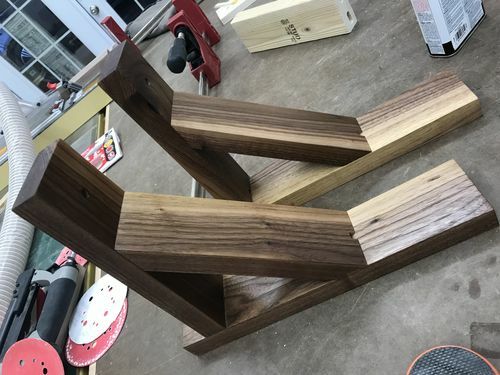 I used some black walnut I had. There was a nice bit of sap wood that made cool contrast. Just finished with some danish oil to warm them up a bit. Again, nice work! Where did you get that cord/hardware for yours?